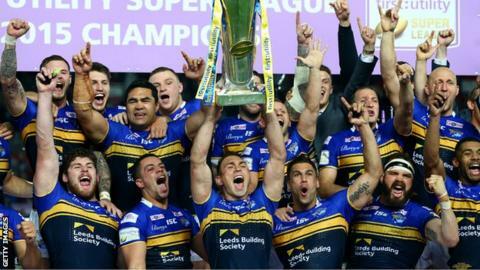 Leeds Rhinos sent the departing trio of Jamie Peacock, Kevin Sinfield and Kylie Leuluai out in glory by beating Wigan in the 2015 Super League Grand Final. Brian McDermott's side completed a domestic treble, adding to the League Leaders' Shield and Challenge Cup. Despite twice trailing, the Rhinos fought back, with Danny McGuire scoring two of four tries, the last of which was by 20-year-old Josh Walters. Joe Burgess, Dom Manfredi and Matty Bowen all went over for Wigan. In winning the three domestic trophies, Leeds have emulated St Helens' feat of 2006. Cherry and White has been the dominant colour scheme in finals between the two clubs, with six Wigan wins before this triumph, but blue and amber finally won the day this time. The retiring Peacock in particular will savour the moment, taking a ninth winners' ring from his 11 appearances. Sinfield, who is switching codes to join union side Yorkshire Carnegie, lifted the trophy for the seventh time as captain. Leuluai, the quiet man among the departing Rhinos, keeps up his record of never having lost in six appearances as he heads into retirement. Leeds had never beaten Wigan in a major final, previously losing the John Player Trophy (1983), Challenge Cup (1994, 1995, 2011), Premiership Final (1995) and Grand Final (1998). It was a victory for rugby league before a 73,512 record attendance for a Grand Final at Old Trafford, despite the presence of England's union side just miles away playing Uruguay at the nearby Etihad Stadium. Bowen did not deserve to be on the losing side as he too bows out, heading home to Australia after serving the Warriors well in two seasons. The title of Peacock's autobiography - No White Flag - summed up Leeds' commitment, as they showed character to keep going at the end of a punishing campaign. Adam Cuthbertson ended the game bloodied, veteran Peacock was struggling physically at times while Rob Burrow played for long spells at dummy-half. Their willingness to dig deep proved crucial, plucking the winning try on the back of intense pressure and then clinging on. Wigan's 2014 final was overshadowed by Ben Flower's early dismissal for punching, but it was a blow of a different sort they struck to begin this game. They worked a fine move to the left, Matty Smith setting England back-row Liam Farrell through a gap and he released Burgess for a simple touchdown. However, Smith fumbled the restart and from the subsequent field position, Sinfield popped a kick through for McGuire to cross. McGuire was involved again in controversial circumstances when his dropped ball bobbled loose for Zak Hardaker to feed Joel Moon. It went upstairs, but the video referee ruled a try despite the knock on. McGuire backed up a break involving Tom Briscoe and Kallum Watkins to grab his second and steer Leeds to a 16-6 half-time lead. Shaun Wane's side rolled through Castleford and Huddersfield in their two games before the final and showed confidence and character to stun the Rhinos. A huge ball steal on Ryan Hall from Manfredi from a chip kick saw the Wigan winger cross in the corner after the break. Bowen showed twinkle toes to cut Leeds to ribbons at the back and then converted his own score to fire Wigan ahead. Bowen kicked Wigan four points ahead, but with the Rhinos stretched a try came out of nothing from one of the new breed at Headingley. Walters strode across after a kick to the left was kept alive to break Wigan again, and Sinfield swung momentum back Leeds' way with the conversion. That score seemed to drain the life from Wigan, who could only watch as the clock ticked down on their title bid, once again pipped by the Rhinos. McGuire picked up the Harry Sunderland trophy, as much for his organisation and leadership as his try scoring. He cajoled and inspired his team-mates, pulling them into line and position when the going was hard, and he will be a vital link between the winning legacy of Sinfield and company for next season and beyond. Leeds Rhinos: Hardaker; Briscoe, Watkins, Moon, Hall; Sinfield, McGuire; Garbutt, Burrow, Peacock, Ablett, Delaney, Singleton. Replacements: Leuluai, Cuthbertson, Keinhorst, Walters. Wigan Warriors: Bowen; Manfredi, Bateman, Gildart, Burgess; Williams, Smith; Crosby, McIlorum, Flower, Tomkins, Farrell, O'Loughlin. Replacements: Powell, Clubb, Mossop, Patrick.